Tatyana Kulida is a Russian born artist who lived and studied art in he USA and then studied for three years at the Florence Art Academy, Italy, followed by three years as a tutor at the Academy. She now lives in Wellington and is an active portrait artist whose work includes a portrait of a recent New Zealand Prime Minister, for the official PM portraits hung in Parliament. 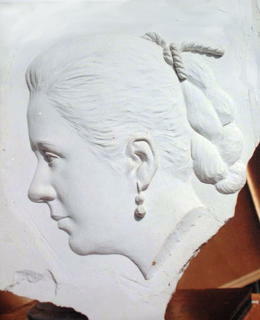 Tatyana can be commissioned to create a portrait bust or bas-relief sculpture of someone you want to honour in a unique and special way. 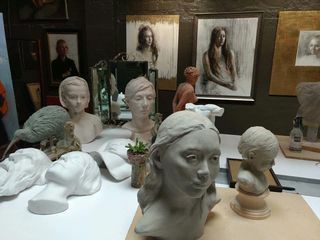 The busts are usually life size and made from clay. For information on commissioning a bas-relief sculpture, please click on the bas-relief example below. A bust could be made to remember a loved one and offers a tactile experience that no other form of representation art can. 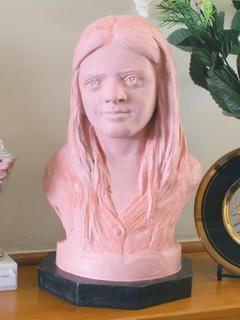 Busts are ideally made from real life but can also be made from suitable photographs. On commissioning a bust you will be provided with information on what photos are needed. The standard fee for creation of a life size clay bust is $4000. There is a non refundable deposit of 30% when a bust is commissioned. To commission a bust please email us through the contact page on this site and we will discuss your individual requirements. Examples of busts on this page are made by Zad Jabbour. Zad is currently living in Lebanon and presently unavailable.